Since their 1980’s gold-watch release, Carlo Crocco’s company went a long and elegant way, statement that can be also said about the Bitcoin, created by the anonymous Satoshi Nakamoto, just a few years ago, which has already revolutionized the banking systems worldwide. At its first watch fair, the descendant of an Italian watchmaker family made a sensation with a watch made of a gold case paired with a rubber bracelet, as a precious material had never been combined before with such a wristband. On the other side, there are the cryptocurrencies and the blockchain technology, already used by millions worldwide. Both innovations had the road unpaved at the beginning, taking people time to discover and benefit them. Hublot and Bitcoin have gone a long way before becoming what they are today and before meeting along the way. 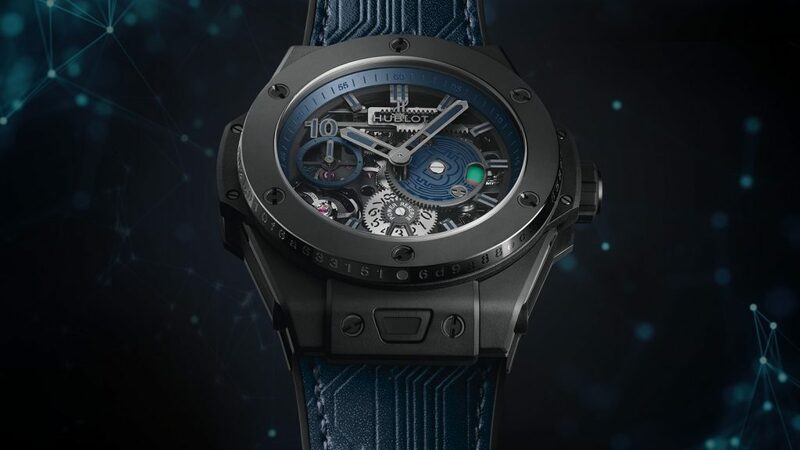 Hublot launched on 6 November their new state-of-art watch called the Big Bang Meca-10 P2P in a limited edition, 210 pieces to be precise, to celebrate ten years since the creation of Bitcoin. “210” as a reference to Bitcoin’s 21 million max cap and the ten years which are referred by the ten days’ power reserve of the watch. The masterpiece can only be bought with bitcoins, and each piece is one of its own. After the purchase, you will get the transaction ID engraved on the bezel’s edge which makes the watch easy to trace if it gets stolen and then shows up for sale. The watch tells the Blockchain story in detail through its own whitepaper, having the whole product theme designed towards this direction: from the gears inside the watch to the blue calfskin leather strap. – User anonymity, the purchase is very discrete and only OS Limited (OSL), the Hong Kong company that conducts background checks on the buyers. They will also perform anti-money-laundering checks to make sure the bitcoin comes from a legit source. – No third-party interruptions, no banks, government or other financial departments can interrupt your transaction. The system is purely peer-to-peer. – No taxes, since no third party is involved, no sales taxes are added. – Very low transaction fees, any transfer in Bitcoins is very fast and with low transaction costs on the Blockchain, eliminating the inconvenience of typical authorization requirements. If Hublot’s masterpiece sounds tempting but you are still not sure on how to get your bitcoin, BitCanuck comes with the solution; everything starts with a new account registration that takes seconds followed by a safe verification process, just like the one Hublot is conducting. Once the KYC is completed, you can start buying directly, with your credit card or wire transfer. All your information is safely kept, and your bitcoins will be cold storage kept, in order to enhance your security to 100%. Your BitCanuck.ca account gives you access a whole new dynamic crypto world, where the possibilities are unlimited. The platform is user-friendly, and the support team is available on a 24/7 basis. Register now with few clicks, by following this link. Crypto Choice: Initial Coin Offering or Security Token Offering?